Your last film Mogudu was released in November 2011. Why is there so much of a gap? Sahasam was okayed before the release of Mogudu. I have started a film in the direction of Bhupati Pandyan and scrapped it after a few days of shoot. The shooting of Sahasam got delayed. Hence there is a gap of 1 and half years. Chandra Sekhar Yeleti is known for intelligent cinema and you are known for mass films. What made you do two films together? Sahasam is a film that matches the sensibilities of Chandra Sekhar Yeleti and me. Chandu brings believability and logic with his realistic writing. He has also balances the narration in such a way that it satisfies my audiences as well. 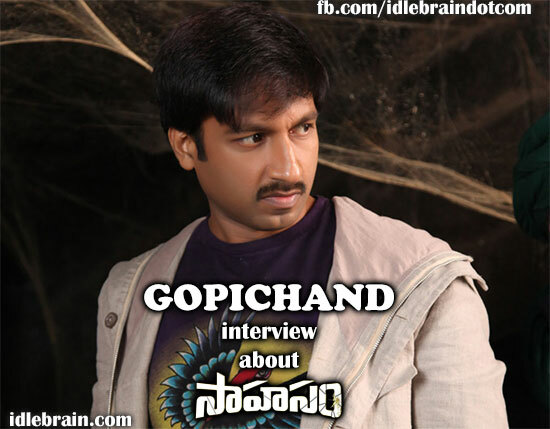 Tell us about Sahasam film? I am playing the role of a security guard who is settled in that job because he had no other choice. He is a kind of guy who wants to make a lot of money, but stuck with the low-paying job to earn bread and butter. He gets to know that he has ancestral property that rightfully belongs to him in Pakistan. The rest of the story is all about the adventure (sahasam) he makes to get his property back. Tell us about romance part in Sahasam? Tapsee is not doing a typical commercial heroine role. She meets the hero in the travel. There will not be any cinematic romance in this movie. How different are you in this film? Chandu tried showing me in a realistic light. I learnt horseriding for this movie and you can see me in posters/trailers riding a horse. I twisted my ankle while shooting for this movie. It forced me to take a month break during which I learnt horseriding. What about shooting in Ladakh? Ladakh is low on oxygen levels. We get tired even if we run for 20 meters. We used to take help of oxygen masks in between. It was a month schedule. The trailers suggest a grand graphics-oriented climax? We have shot the climax episode in 25 days. A set was erected at Ramoji Film City and shot the climax episode which lasts for 30 minutes.It involves a lot of graphics as well. I used to get excited when I watch adventurous Hollywood films when I was a kid. I am very happy to do one now. What are going to be technical highlights of the movie? Cinematography by Shyam Datt is going to be one of the highlights. He has done an extraordinary job and he had to forego many offers for this movie. Chandu and Shyam traveled together for more than 10 years and it shows in the movie. Shyam Datt is currently doing part 2 of Vishwaroopam. Action choreography by Selva are going to be another highlight. The adventurous episodes are going to stand out. Background music by Sri is terrific. Is lady luck going to help you with Sahasam? I am leading a good married life now. Let’s hope that the lady luck will help me with Sahasam. Two scripts are being worked on now. One by B Gopal and another one by Deva Katta. Deva Katta’s project will be produced on Bhavya Creations banner.